Importance of reactive power is increasing with growing demand for electrical power by many domestic and industrial utilities, in power system network. 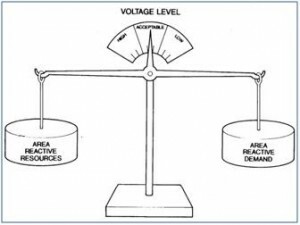 Stability and reliability of electrical power system depends on reactive power management. It is required to generate energy in a more efficient, reliable and cost effective way. Effective way of delivering electrical energy utilizes technologies like FACTS (Flexible AC transmission system), SVC (Static voltage compensation), etc to maintain voltage stability, high power factor and less transmission losses. Reactive power plays crucial role in the power system network. 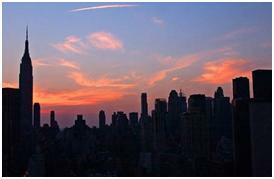 AC power supply systems produce and consume two types of powers; active and reactive power. Real power or active power is the true power given to any load. It accomplishes useful work like lighting lamps, rotating motors, etc. 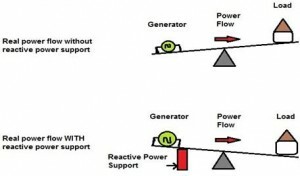 On the other hand reactive power is the imaginary power or apparent power, which does not do any useful work but simply moves back and forth in the power system lines. It is a byproduct of AC systems and produced from inductive and capacitive loads. It exists when there is phase displacement between voltage and current. It is measured in units of volt-ampere reactive (VAR). Power system equipments are designed to operate within ±5% of the nominal voltages. Fluctuations in voltage levels lead to malfunctioning of the various appliances. High voltage damages the insulation of windings where as low voltage causes poor performance of the various equipments like low illumination of blubs, overheating of induction motors, etc. If the power demand is more than that supplied by transmitting lines, current drawn from supply lines increases to a higher level, which causes voltage to fall drastically at the receiving end side. If this low voltage is decreased further, it leads to the tripping of generator units, overheating of motors and other equipment failures. To overcome this, reactive power should be supplied to the load by putting reactive inductors or reactors in transmission lines. Capacity of these reactors depends on amount of apparent power to be supplied. If the power demand is less than reactive power supplied, the load voltage rises to a higher level which leads to automatic tripping of transmission equipments, low power factor, insulation failures of the cables and windings of various mechanical devices. To overcome this, additional reactive power available on the system must be compensated. Various compensation equipments are synchronous condensers, shunt capacitors, series capacitors and other PV systems. These devices inject the capacitive reactive power to compensate inductive reactive power in the system. 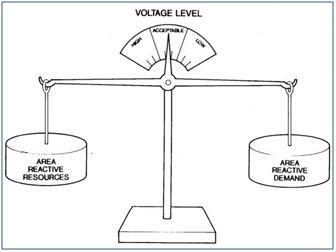 From the above discussion, we can say that apparent power is required to maintain voltage levels within limits for stability of the transmission systems. Several electrical blackouts, like that at France during 1978, northeast countries in 2003, many parts of India during 2012, have noticed insufficient reactive power on electrical power system is the main reason for blackout situations. This is raised because demand for apparent power is unusually high due to long distance transmission. This ultimately leads to shut down of various equipments and generation units due to low voltages. So to ensure proper working of the electrical system, sufficient amount of reactive power must be present in it. Transformers, motors, generators and other electrical devices require reactive power to produce magnetic flux. This is because generation of magnetic flux is necessary for these devices to do useful work. In the above figure reactive power, indicated by red color, helps to create magnetic field in motor but it leads to decrease the power factor. 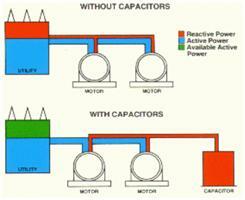 This is why a capacitor is placed to compensate the inductive reactive power by supplying capacitive reactive power. Most of the equipments connected to the electric supply systems consume or produce apparent power but not all these control the voltage levels. Power plant generators generates both active and reactive power where as capacitors injects the reactive power to maintain the voltage levels. 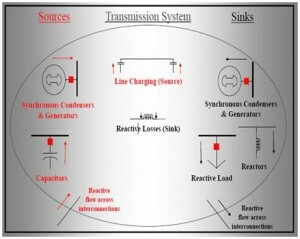 Some of the sources and sinks are given in below diagram. 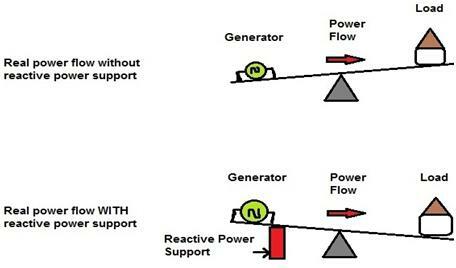 Basically there are two types of reactive power sources namely dynamic and static reactive power sources. These include transmission equipments and devices, which are capable to respond to the reactive power changes quickly by injecting or providing the sufficient amount of reactive power into the electrical system. These are of high cost and some of these devices are given below. • Synchronous generators: Depending on the excitation voltage, active and reactive power generated is varied in synchronous machines. AVR’s (Automatic Voltage Regulators) are used to control the reactive power over an operating range in these machines. • Synchronous condensers: These are types of small generators, used to produce the reactive power without producing real power. • Solid state devices: These include power electronic converters and devices such as FACTS by SVC devices. These are low cost devices and response to reactive power variation is somewhat less than the dynamic power devices. Some of the static resources are given below. • Capacitive and inductive compensators: These consist of some shunt capacitors and inductors connected to the system to adjust the system voltages. Capacitor generates the apparent power whereas inductor absorbs the reactive power. • Underground cables and overhead lines: Current flowing through the cables and overhead lines produces the net magnetic flux which generates the reactive power. A lightly loaded line acts as reactive power generator while heavily loaded line acts as absorber of reactive power. • PV systems: These are used for active power injection as well as harmonic and reactive power compensation in the grid systems by photo voltaic power. 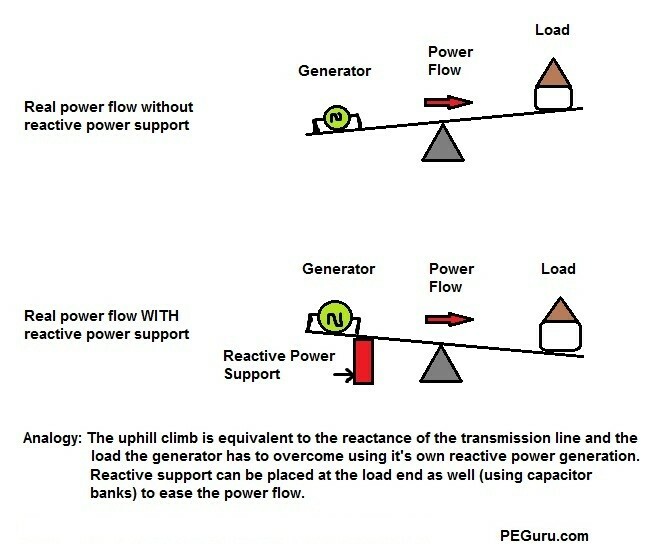 Reactive power generated by the generators and other sources is absorbed by some of the loads which are given below. It causes losses in these devices; hence compensation devices are necessary to be placed at these loads. This is all about the importance of reactive power. I would like to thank the readers for spending their time on this article. Here is a question for interested readers – What is power factor and how can we achieve power factor compensation. It is requested to write the answers in the comment section below. Next › Get Ready to Build 10 Different Electronic Projects on Your Own! sir according to you reactive power and apparent power are same,then how will you explain power triangle? Please go through the above link,where you can find the Sample ppt and it can be downloaded. Hi Ramya, Thank you for your appreciation. It really helps us to work hard.